"The best things come to those who wait!" If you were alive in the '80s, you know exactly what this means. The slogan was meant to emphasize the thickness of the product, as a trademark of quality, and that slow pours out of the glass bottle meant the reward of such a high-quality condiment on your food. These packets eliminate that need to wait. Instant ketchup, squeezed right out. We keep a drawer full of these packets (as well as other single-serve condiments, and dry packets) in our kitchen. I no longer buy it by the bottle because it is easier and keeps better this way. I have even adjusted my recipes to quantity of ketchup packets rather than in cups! These are great to have on hand, and pack easily for picnics or vacations. These are convenient for home use as well. The Heinz brand is tasty and of great quality. I pack them for my husband's lunches. It is also great for portion control. Don't settle for less then the best. Keinz Ketchup is that !... 10000 packs in a case at a great price. This is what we use with all our to go orders. These ketchup packets are great. They are a little on the expensive side but our customers like the Heinz brand much more than the off brand. I do not mind spending the extra money to buy these because they are much more high quality. These packets always contain fresh ketchup of the heinz quality. There are a few restaurants that sell the customer a larger pouch or a secret sauce but these have been around most. The rich, smooth taste of Heinz ketchup will make your guests smile. And, these nifty little portion packets are economical, reducing waste. They're also great for on the go or large gatherings. Heinz is the number one name in ketchup. These portion-control sizes are both convenient and economical. They're perfect for take out orders or when hosting a large event. I can't say enough good things about this product. I have switched many times to knock off catsup packets, only to come back to Heinz, they have the best flavor and it's also a well branded product. Heinz is the best brand in Ketchup you could buy for your restaurant. The packets are great for our to go orders and drive thru orders. Portion control is vey important in the restaurant industry. You might pay more by ounce but you save so much more when customers can't put massive amounts of ketchup on their plate and not eve eat it all. Convenient for take out orders and home use alike, these little packets offer a big return. When customers see the name Heinz, they know they're getting a quality product and feel as if somebody cares. We used these packets at a large picnic. Using the packets made the buffet line go so much quicker, and it also kept the table looking much cleaner! It also has held up well in storage. Can’t go wrong with Heinz ketchup. First time buying packets and I have to say it was a lot nicer and cleaner than using the pump ketchup. This is the same quality product we get from our wholesale restaurant supplier at a cheaper price! Excellent for restaurants who offer takeout, like we do. There is no ketchup in the world that tastes as good as Heinz! This is a great way to give your customers the quality of Heinz in to go packets. It is also great for portion control and for home use. The price is no better on any other site. I would definitely recommend it. HEINZ SAYS IT ALL FOR THE GREAT QUALITY KETCHUP, YOU CAN'T BEAT THE FLAVOR! 1000 PACKETS IN THE CASE AT A GOOD PRICE,YOU CAN'T BEAT THIS DEAL. These are just what you would expect. 1000 packs in a case. Box they are shipped in is sturdy. Heinz ketchup is the go to standard. Good size amount in case, they are the perfect size for grab n go and customers recognize them, we are very happy with this product. My customers love these. Theyre way better than just pouring out some ketchup into a plastic container. The ketchup itself is standard Heinz which is delicious. I will definitely order again. Box came undamaged and none of the packets were leaking. Greta Ketchup! Our guest seem to really like the to go packets. It's easy to use and less hassle for busy days with little no mess. Heinz ketchup is one of my favorite dressing for burgers. It goes very well with fries as well. The convenience pouch comes in great for food service. Everyone’s favorite ketchup. If you have a restaurant, this is a must have. Heinz has a nice balance of sweet and savory that is sure to please. I love the fact that these come in such a big quantity. They are not that expensive either. I recommend that you put this on auto reorder to save money on shipping. The Heinz ketchup packets are the best on the market. You can not beat the great taste of Heinz ketchup. These are perfect for fries and go great on our condiment bar. Great product it his cheaper on here than getting it through any other vendor. My package arrived on time and the only issue i had was that one of the boxes was open. I love these portion control packets. Heinz makes the best ketchup and no their brand can compare. Customers appreciate getting name brand ketchup with their meals. Who doesn't love Heinz ketchup? And these are just a great way to take them to go or to offer them to your customers in portion control sizes. They are more expensive then the off brand buy why settle for that when you can make your customers happy with Heinz? I much prefer these over our food suppliers as they like to put Sysco on everything. Branding stuff with Sysco looks tacky in my opinion and customers don't know what it means and it looks "generic". The price is great here too! Heinz is the best tasting and best quality ketchup on the market. The portion packs are great for carry out and very easy to tear open. I love Heinz ketchup. It's the only brand I prefer to use. I love when I go to restaurants and they offer these packs because they're convenient and disposable. The Heinz ketchup packs taste great, they're a great price and the customers loved it. Getting 1000 packs at a time is helpful to maintaining inventory. Convenience packets great for our carryout customer. Some of the packet were dirty from what looks like leakage of ketchup. Prices were great will purchase again. Heinz ketchup is delicious. It's got the perfect combination of sweetness and tanginess. The only thing I don't like about these packets is that they don't all rip easily. I don't offer ketchup on the gourmet hot dogs at my shop, but I always get asked, so I started carrying these as an option. Name brand recognition seems to be important to the customer, so worth the price it adds. There is no better ketchup than Heinz. This is nice to have alongside an order of fries because it's the perfect amount for a small cup. I love Heinz ketchup packets. They are a super easy way to control portion. Along with throwing in the bag for a to go order. Whenever I get fast food these are the ketchup packets I find in the bottom of the bag. They work, however they're a lot more messy than the Heinz hard plastic cups some have transitioned to. Great price for the amount of ketchup packets. Ketchup is better tasting than other brands wr have tried. One box lasted us a long time. I like the 9 gram packs. You need less for customers which saves you more money rather than buying the 7 gram packs and customers taking more. Heinz ketchup is a great tasting ketchup that doesn't have that sugary taste. I have come across a lot of generic brands that did. I found that to be very unappetizing. This product is great for portion control or for anyone who loves Heinz that could take the product for work or school lunches. Perfect for our to go orders. Not too large of portions, and makes customers happy. We will be ordering them again on our regular staple orders. Very good in taste, best till now of what I have ever tasted. No other ketchup is in comparison with this. Buy this for best taste. The delicious flavor and texture you expect from Heinz ketchup, in convenient packet form. Stocking this brand name staple is a sure sign of quality, that will be appreciated by customers. Very convenient item for our customers. We throw in a few ketchup packets for every order of french fries or sweet potato fries. Cant go wrong. Heinz is a name that everyone knows and loves and these little packets are perfect for taking with you and are perfectly portioned for various things. Everyone loves Heinz Ketchup. 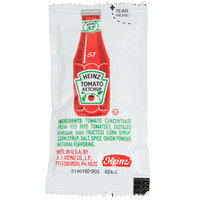 This is the go-to ketchup packet for carryout and delivery orders. It's a real time saver over filling ramekins for orders. These ketchup packets are great for giving to our customers that have take out orders. They come in the standard small packets and are of quality taste. Just got the case yesterday. Highly recommend everyone. Great option for serving specifically during outdoor festivals. Most likely will order more in the future of needed. Heinz ketchup usually quality stuff and tells your customers you aren't cheap. Yeah u can buy Heinz here for what you have been paying for the generic stuff. These packets from Heinz give you the same great tasking ketchup in a single serv packet. You can't go wrong with Heinz ketchup. Don't settle for a less premium brand, Heinz has the right balance of sweetness and fresh tasting ketchup. These are very convenient and well worth the price to have for our customers to have in the store. Great product, I would definitely recommend. Nothing bad to say about this - everybody loves Heinz! It is a great price for a much needed product in any deli or sandwich shop. Can't beat a classic. Still no other ketchup tastes like Heinz. Perfect size for our customers that request ketchup with one of our menu items. These ketchup packets are perfect for any event. We used them at a large family barbecue, and the size of them was perfect! People were able to grab a few and put them in their pockets while juggling the hamburgers and hotdogs, leaving a hand free to carry drinks and chips. There's enough ketchup for a burger or dog in just one packet. They're the same size as the ones you see at chain fast food restaurants, and the same delicious taste too!